MANILA ELECTRIC Co. (Meralco) said its joint venture company Pure Meridian Hydropower Corp. had broken ground in Lalawinan, Quezon province for a 3-megawatt (MW) run-of-river mini-hydropower plant. The Lalawinan plant is the second project under the joint venture (JV), which is a partnership between Meralco and Repower Energy Development Corp., a unit of Pure Energy Holdings Corp. The first project, the Pulanai, Bukidnon mini-hydro project, had its groundbreaking in December 2016. The Lalawinan plant is Meralco’s first foray in run-of-river hydropower in Luzon. “It is our hope that these various initiatives will contribute in providing a stable, clean and reliable energy source,” said Mr. Panlilio, who is also Meralco senior vice-president. The Lalawinan project is expected to cost P700 million and generate more than 200 jobs during construction, mostly hired from the local community. It will connect to the transmission infrastructure of Repower’s Upper Labayat 3-MW mini-hydro power project through a 10.5-kilometer 69-kilovolt (kV) line. The power plant will have two generating units with terminal voltage of 4.16 kV and with total output of 3 MW using a 5-megavolt ampere 4.16/69 kV step-up transformer. Its expected annual power generation will be at least 16 gigawatt-hours from the renewable energy source. “Our goal is to provide sustainable alternatives to balance the country’s over dependence on fossil fuels, while preserving our natural watersheds,” he said. 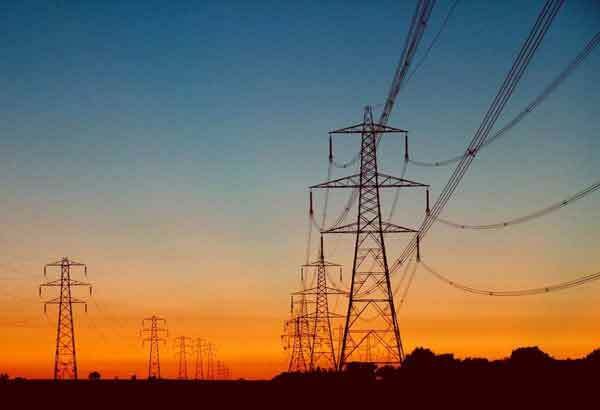 The project aims to avail of the run-of-river hydropower feed-in-tariff (FiT) rate, which the Energy Regulatory Commission set at P5.90 for every kilowatt-hour exported to the grid. The rate has been reduced this year to P5.8705 per kWh as called for by the FiT rules. The incentive scheme ends this year. Run-of-river hydropower is the cheapest renewable energy resource being charged under FiT. Lalawinan is Repower’s third hydropower groundbreaking so far this year. Pure Energy’s hydropower arm has several operational hydropower plants in Laguna. It is aiming to break ground on two more hydropower projects this year, and 15 more in the next three years. “After cementing a foothold in the baseload hydropower and geothermal sphere, Pure Energy plans to venture into the intermittent solar energy for a balance portfolio of renewable energy projects,” Pure Energy said. Meralco is the country’s largest electric distribution company with coverage of 36 cities and 75 municipalities, including Metro Manila. It serves more than six million customers. Meralco’s controlling stakeholder, Beacon Electric Asset Holdings, Inc., is partly owned by Philippine Long Distance Telephone Co. (PLDT). Hastings Holdings, Inc., a unit of PLDT Beneficial Trust Fund subsidiary MediaQuest Holdings, Inc., has interest in BusinessWorld through the Philippine Star Group, which it controls. PURE Meridian Hydropower Corp. (PMHC) said it has broken ground on its 3-megawatt (MW) run-of-river mini hydropower plant in Lalawinan, Quezon Province. PMHC is a joint venture of Manila Electric Co. (Meralco) with Repower Energy Development Corp. (REDC), a subsidiary of Pure Energy Holdings Corp. The Lalawinan hydropower plant is the second project under the partnership, PMHC chairman Alfredo Panlilio said in a statement on Wednesday. The first partnership project is the Pulanai mini hydropower plant in Bukidnon, which had its groundbreaking last December. The Lalawinan plant will connect to the transmission infrastructure of REDC’s Upper Labayat 3-MW mini-hydro power project via a 10.5-kilometer, 69-kilovolt (kV) line. It will have two generating units, and the total annual power generation will be over 16-gigawatthours (GWh) from this renewable energy source. The project cost is P700 million and it is expected to generate over 200 jobs during construction, mostly hired from the local community. The project will avail of the run-of-river hydropower feed-in-tariff (FiT) rate of 5.90 per kilowatt hour. ROR hydropower is the cheapest renewable energy resource being charged under FiT. “We reiterate our earlier pronouncement that our investments in the various run-of-river mini hydro projects are a manifestation of our unwavering commitment to support the development of the renewable energy sector. It is our hope that these various initiatives will contribute in providing a stable, clean and reliable energy source,” Panlilio added. PMHC and Pure Energy’s CEO Dexter Y. Tiu said they remain focused on putting forward knowledge on run-of-river (ROR) technology. “Our goal is to provide sustainable alternatives to balance the country’s overdependence on fossil fuels, while preserving our natural watersheds,” Tiu said. World Wide Fund recently signed a partnership with Pure Energy to identify key areas for potential run-of-river hydropower development. A Seize the Flow campaign was also recently launched by the parties to promote awareness and preservation of the watersheds. “We are committed to help save our last remaining Sierra Madre rainforest and wildlife habitat here in Quezon, which is our humble way of participating in the war on climate change,” Tiu added. The Lalawinan plant is Meralco’s first foray in run-of-river hydropower in Luzon, while for Pure Energy’s hydropower arm, REDC, this is its third hydropower groundbreaking this year. Aside from Lalawinan, REDC is targeting to break ground on two more hydropower projects this year, and another 15 hydropower projects in the next three years. Meanwhile, Pure Energy plans to venture into the intermittent solar energy for a balanced portfolio of renewable energy projects. Two subsidiaries of Pure Energy Holdings Corp., together with Giga United Power and businessman Willy Ocier, have formed a consortium to build mini-hydropower plants in the province of Quezon—a venture that is expected to cost P660 million. 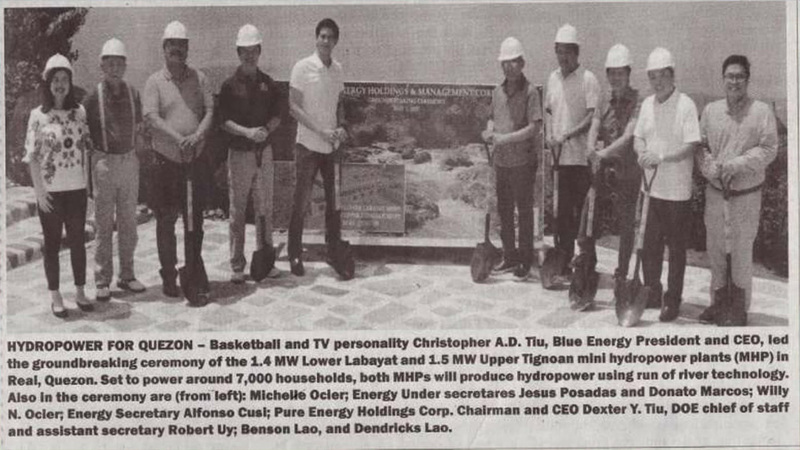 The two firms are Blue Energy Holdings and Management Corp. and Repower Energy Development Corp. (REDC), the former headed by professional basketball player Christopher Tiu. Construction of the facilities will begin in June 2017 in Real, Quezon. Once completed, the Lower Labayat and Upper Tignoan mini-hydropower plants will have 1.4 and 1.5 megawatts of installed capacities respectively, and will cascade through the Labayat and Tignoan rivers. "After years of predevelopment work, we look forward to starting the construction phase of our two mini-hydro projects in Quezon province," Tiu said. "These power plants will harness our abundant river waters to generate electricity in a clean and sustainable manner." "Furthermore, we expect to generate more than 400 jobs through these projects," he added. The two mini-hydropower plants will power around 7,000 households and will generate almost 17 gigawatt hours annually. They will deliver an average of 65 percent of plant capacity year round upon project completion. Set to be completed in 2019, the projects will apply for the feed-in-tariff subsidy at a rate of P5.90 a kilowatt-hour for run-offriver mini hydropower. The Lower Labayat project will connect to REDC’s Labayat 1 hydropower plant, sharing the same transmission lines and access roads, while the Upper Tignoan project will connect to the REDC switchyard nearby. Aside from the Lower Labayat and Tignoan groundbreaking, REDC will be starting work on its 3-MW Lalawinan run-of-river hydropower plant with joint venture partner Meralco, also within the month of May. REDC has been aggressive in building up a portfolio of hydropower projects in Luzon, Visayas and Mindanao. Pure Energy Holdings Corp. and its partners have started the construction of two mini-hydropower plants that will augment clean power supply by three megawatts in Real, Quezon. MANILA, Philippines - Pure Energy Holdings Corp. and its partners have started the construction of two mini-hydropower plants that will augment clean power supply by three megawatts (MW) in Real, Quezon. Pure Energy subsidiaries Blue Energy Holdings and Management Corp. and Repower Energy Development Corp. (REDC) have formed a consortium with Giga United Power and Willy N. Ocier for the P660-million mini-hydropower plants. The group started work on the access roads while full construction will start in June. The Lower Labayat and Upper Tignoan mini-hydropower plants will have 1.4 MW and 1.5 MW installed capacities, respectively. "After years of pre-development work, we look forward to starting the construction phase of our two mini-hydro projects in Quezon province. These power plants will harness our abundant river waters to generate electricity in a clean and sustainable manner," Blue Energy president and CEO Christopher Tiu said. "Furthermore, we expect to generate more than 400 jobs through these projects," Tiu added. Business ( Article MRec ), pagematch: 1, sectionmatch: 1	The two mini-hydropower plants will power up around 7,000 households and will generate almost 17 gigawatt-hours annually. The plants are expected to deliver an average 65 percent plant capacity year-round upon completion. Once completed in 2019, the consortium will apply for the feed-in-tariff (FiT) rate of P5.90 per kilowatt-hour (kwh) for run-of-river mini-hydropower. After these two mini-hydropower plants, REDC will be groundbreaking its three-MW Lalawinan run-of-river hydropower plant with joint venture partner Manila Electric Co. (Meralco) within the month. The Lalawinan project, which is its second project with Meralco, is also located in Quezon. It was in December 2015 when Meralco and REDC forged a partnership to build and develop mini-hydropower plants using run-of-river resources. Earlier this year, Pure Energy announced it plans to conduct an initial public offering (IPO) this year, targeting to raise P1.5 billion for the development of hydropower projects. It is eyeing to have a 500 MW of total capacity in five years with a basket of renewable energy projects such as hydropower wind, solar and biomass investments. National Transmission Corp. (TransCo), owner of the country's power transmission assets, has been certified with the new international management standards for upholding optimal grid operations and administration of incentives for renewable energy technologies. TransCo was formally awarded the International Organization for Standardization Certification for Quality Management System (ISO 9001:2008) after successfully passing a certification audit conducted by TUV Rheinland last Jan. 24, 2017. The scope of ISO certification covers TransCo's mandates of ensuring compliance of the concessionaire with the concession agreement, settlement of right of way claims, divestment of sub-transmission assets, operation and maintenance of electrical systems of contracted ecozones, administration of feed-in tariff (FIT) allowance fund and providing corporate support services. The state-run firm's ISOcertified quality management system "will serve to enhance our efficiency, reliability, responsiveness and transparency" as well as "improve our ability to achieve our targets," TransCo president and CEO Melvin Matibag said. In successfully passing the audit, TransCo registered zero non-conformity and was cited for several positive findings which reinforced its bid for the award. Among others, TUV Rheinland commended TransCo's "comprehensive monitoring of customer complaints prior to close out" and the "completeness of records of monitoring and reports" of right-of-way management and the "use of graphical presentation to analyze the results of evaluation of training effectiveness." Matibag urged employees to maintain the high level of service required by ISO certification. "Any quality initiative will not be realized without top management support," TUV managing director Tristan Arwen Loveres said. THE Senate energy committee prefers keeping the Agus-Pulangi hydroelectric power facilities in Mindanao in government hands, but with professional management from the private sector installed. “If ever, the Senate will keep Agus-Pulangi in the portfolio of government gencos (power generation companies),” said Sherwin T. Gatchalian, chairman of the Senate committee on energy in a recent interview. The Agus hydro power asset has an installed capacity of at least 700 megawatts (MW). 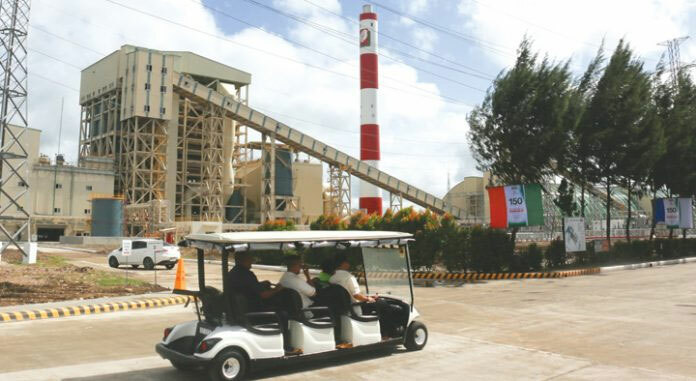 The biggest plant in the complex is the 200-MW Agus VI in Iligan City, which has five operating units, two of which have a capacity of 25 MW each and the rest with 50 MW each. The Pulangi hydroelectric power plant in Maramag, Bukidnon has three units, each with an installed capacity of 85 MW. The power generation facilities are considered Mindanao’s crown jewels. “My personal proposal is to create a new company, [and] move the assets of Agus-Pulangi in that new company,” Mr. Gatchalian said. “That company will operate as a GOCC (government-owned or -controlled corporation), but managed professionally,” he said. “We can privatize the operation and maintenance, but the asset is owned by the government. What’s important here is that asset should be managed professionally,” he said. “It’s prone to inefficiency. So it has to compete just like any other power plant. It cannot rely on subsidies or incentives; it has to operate like any private genco,” he said. The privatization of the Agus-Pulangi complex is a sensitive issue in Mindanao, where power rates remain low because of these plants’ cheap output. 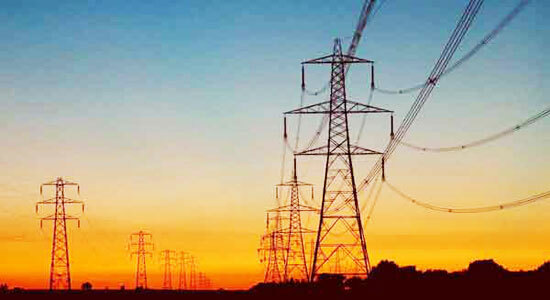 The Department of Finance has called for the sale of power assets that are still with the Power Sector Assets and Liabilities Management Corp. (PSALM) within three years. Privatization is required under Republic Act No. 9136 or the Electric Power Industry Reform Act (EPIRA) of 2001, the law that restructured the power industry. EPIRA created PSALM to take ownership of disposable power assets. Under EPIRA, the sale of Agus-Pulangi should be no earlier than 10 years from the effective date of the law in 2001. It prohibits schemes such as build-operate-transfer, build-rehabilitate-operate-transfer and other variations. Mr. Gatchalian’s comments come after the House of Representatives last month approved a bill creating the Mindanao Power Corp. The House bill seeks the non-privatization of the Agus and Pulangui hydropower facilities. It also pushes for a viable way for the government to operate and maintain the affordable power sources. “The subsidies being given to the SPUG (small power utilities group) areas come from all of us,” he said, referring to areas in the Philippines that are not linked to the interconnected electricity grids in Luzon and the Visayas, and the separate grid in Mindanao. 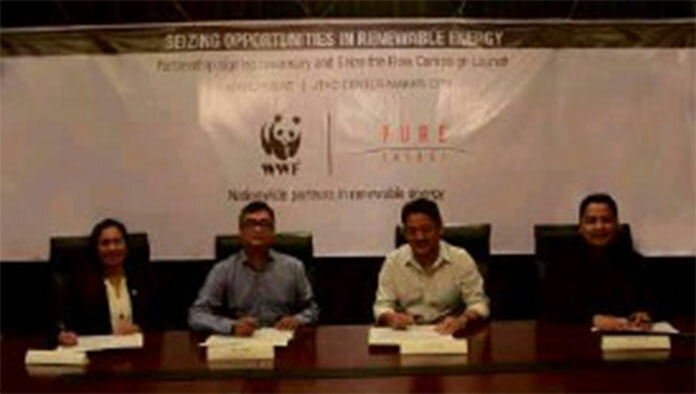 The World Wide Fund for Nature (WWF) Philippines and Pure Energy Holdings Corporation (PEHC) recently entered into a partnership aimed at identifying areas of opportunities to deploy renewable energy projects, specifically run-of-river hydropower. These projects will not only reduce the country’s dependence on fossil fuels, but will conserve the few remaining Philippine rainforests and virgin watershed areas. In photo, from left, are Atty. Gia Ibay, head, Climate Change and Energy Programme, World Wide Fund for Nature; Jose Palma, president and CEO of World Wide Fund for Nature; Dexter Y. Tiu, chairman and CEO of Pure Energy Holdings Corporation; and Gary Espino, president and COO of Pure Energy Holdings Corporation. In Photo: This file photo shows the Panay Energy Development Corp.'s 150-megawatt "clean coal" power plant the firm switched on last year. The power plant is considered the largest single-generation unit in the Visayas. WITH much enthusiasm, climate and environmental advocates see the ratification of the Paris Agreement by the Philippine Senate both as a challenge and opportunity to shift from dirty fossil fuel to clean renewable energy (RE). Although ambitious, reducing the country's greenhouse- gas emission by 70 percent between 2020 and 2030 will be a tough nut to crack, as it struggles to sustain growth currently pegged at 6.8 percent last year. This goal is yet clearly a "conditional" commitment largely dependent on the support the Philippines will get from the international community. Last year the Climate Change Commission (CCC) said RE presents the biggest opportunity for local investment as the country plans to veer away from coal. An environmental advocate, Environment Secretary Regina Paz L. Lopez vowed to expedite the granting of environmental compliance certificates (ECCs) for RE projects while thoroughly reviewing ECCs for potentially destructive and environmentally unsound development projects—particularly mining and coal. Among the renewables, climate and environmental advocates are betting on solar and wind over coal in competing for huge investments pouring the power sector's way. Citing the "Boom and Bust 2017—Tracking the Global Coal Plant Pipeline" report, Greenpeace Philippines Climate and Energy Campaigner Reuben Muni said it is just a matter of time when investment starts shifting to the more economically viable clean, RE options, dropping coal in the process. Muni said ditching coal will eventually reverse the trend in favor of solar, wind or other RE sources. WHILE admittedly one of the cheapest and reliable source of energy today, coal is being blamed by climate and environmental advocates for causing not only air, soil and water pollution that undermines human health and environment but for being the biggest contributor to global GHG emissions that trigger climate-change disasters. The Philippines is not oblivious to climate change-triggered disasters. In 2013 the strongest typhoon ever to make landfall in history devastated Central Philippines, leaving a trail of death and destruction. Climate-change effects, such as longer wet season and longer dry seasons, also cause enormous damage to food production areas that undermine the country's food-production capacity, including fisheries. Instead, they said the Philippines can take a more sustainable development path by shifting from its use of dirty coal to more environment-friendly sources of energy, such as solar, wind, geothermal, possibly, ocean current, biomass or biogas—without compromising the integrity of its already fragile environment. INVESTMENT in coal in the Philippines, as well as other energy sources, can only be estimated based on power-generating capacity power plants. For coal investment, the rough estimate can be based on those being constructed and those that are already existing, according to Muni. The country's current installed power-generation capacity is 18,765 megawatts (MW). With a 45-percent share, coal investment in the Philippines is pegged at $8.54 billion. This is a conservative estimate, as the Department of Energy figure accounts only for the power-generating capacity that goes to the main power grid. "A lot of these things are on a specific timeline," Muni said. "One MW of coal is equivalent to $1 million three years ago. But today, this may no longer be true." He explained the equivalent figure could even be higher because coal's volatility causes price to go up. MUNI said coal is like other goods that are subject to market forces at work—economic, politics—like oil and gas, coal price also change. "In the past, during the [Fidel V.] Ramos and Cory [Aquino] administration, our power was based on three big sources—hydro, geothermal and oil diesel," he said. In 2015 around 45 percent of the country's energy supply comes from coal, 23 percent of the country's energy supply comes from natural gas, 13 percent from geothermal, 11 percent from hydro and 7 percent from coal. At some point, oil became the biggest source of energy in the mid-1990s because of the Persian Gulf War and Middle East Crisis—when price of oil was very volatile. "During the last year of the Cory administration and the start of the Ramos administration, we only have the Calaca power plant—the first- ever coal plant in the Philippines," Muni explained. "Then came Pagbilao, Masinloc and Sual. The entry of coal as a power source started to boom." At that time, coal was the cheapest and most accessible source of energy, with the Philippines having the Semirara coal mine, and neighboring countries, such as Indonesia, China and Australia, possibly supplying the Philippines with adequate coal. THE Philippines is currently heavily dependent on coal. According to the DOE, coal has the highest contribution to the country's current power-generation mix pegged at 44.5 percent as of 2015. The local demand for coal is not limited to power generation. In 2015 the cement industry utilized 15.22 percent of the country's coal supply while 5 percent went to other industries, such as alcohol, sinter, rubber boots, paper and chemical manufacturing, fertilizer production and smelting processes, according to the DOE. This factor makes coal as having the biggest share in terms of investment in the country's energy sector. Industries, Muni said, are into coal use for economic reasons, which means the country's dependence on coal could be worse. The DOE, he said, only counts those that feed the power grid. Even oil companies, such as the Petron Oil Refinery in Limay, Bataan, he said has a coal plant with 140-MW capacity. While it powers its oil-refinery facility, Petron is also providing the power grid with the excess power it produces from its own coal-fired power plant, he said. THE country' dependence on coal became more pronounced in the last 15 years. According to the DOE, since 2002, from a historical yearly average of 1.5 million metric ton (MMT), local coal production grew tremendously. Muni said the country started to shift from oil—then the dominant source of energy—to coal during the Cory and Ramos administration. The shift, he said, was because of economic reasons. "During the Persian Gulf war, oil became very volatile," he explained. "With the Philippines having its own coal resources, investment in power shifted to coal." But the Philippines, he said, only has low-grade coal, which means it has to import coal. Around 70 percent of the country's coal requirement are imported. Of that, around 90 percent comes from Indonesia, with the remaining 10 percent coming from Australia and China, making Philippines heavily dependent on Indonesia's coal industry. In the last 13 years, local production of coal grew almost four folds, with production peaking up to 8.17 MMT in 2015, according to the DOE. Muni said it was during this period that the country saw more coal-fired power-plant projects being approved and constructed to meet the increasing demand for energy. The shift to coal as a source of energy was attributed to the highly volatile price of oil in the world market and the failure of the DOE to promote RE sources to investors in the power sector. At that time, Muni admits that RE is not yet economically feasible and the technology not so much available in the Philippines.